Cadets stand vigil at the memorial. BLACKSBURG, Va., Feb. 17, 2010 – A preliminary schedule of public events and campus activities has been announced as Virginia Tech plans for its 2010 Day of Remembrance. Virginia Tech will not hold classes on Friday, April 16, and university offices will open at 10 a.m. to accommodate the thousands of runners and walkers expected for the second annual 3.2 Mile Run in Remembrance to be held early that morning. University employees will be afforded as much work schedule flexibility as possible so they can participate in Day of Remembrance activities. Students, faculty, and campus organizations will organize a variety of “Expressions of Remembrance” events from 11 a.m. to 5 p.m. at venues across campus. Academic program showcases; musical and artistic performances; art creation; and panel discussion on “A Story of Community Resilience” are among the activities being planned. As details on specific events are finalized, complete information will be posted to the We Remember website. A link to this website can be found by clicking on the memorial ribbon located in the upper right hand corner of the university homepage. A ceremonial candle will be lit by members of the Virginia Tech Corps of Cadets and representatives of the student body at midnight. The corps of cadets will stand guard for 32 minutes. The corps of cadets will also stand guard for 32 minutes prior to the scheduled 11:59 p.m. extinguishing. Once the candle is extinguished, the light will be carried back into Burruss Hall, representing the commitment to never forget. 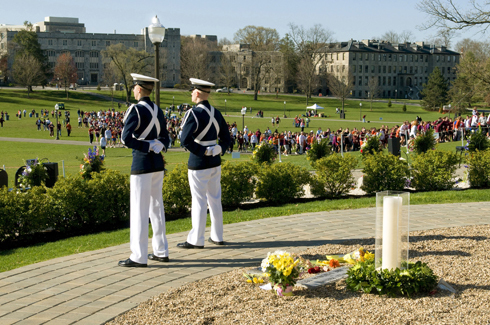 The 3.2 Mile Run in Remembrance will start at 8 a.m. on the Alumni Mall. Participants may run or walk. Commemorative T-shirts will be provided to the first 4,000 who register for the event. A new route will be featured this year. Details and registration information for the Run in Remembrance will be announced the week of Feb. 22. A community picnic will be held on the Drillfield from 11 a.m. to 1 p.m.
At sunset, a university-wide commemoration and candlelight vigil will be held on the Drillfield at the April 16 Memorial. The program will recognize the 32 students and faculty who lost their lives that day with comments on the special qualities of each person read aloud. The event will be coordinated by Virginia Tech students representing a variety of student organizations. Following the candlelight vigil, candles will be collected to repurpose for the 2011 candlelight vigil.